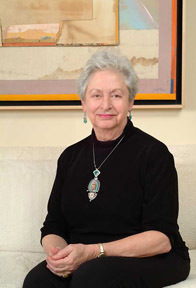 Hilda Fleisher is a long-time and consistent supporter of New Hampshire artists and arts organizations. She is an avid collector of paintings, printings, sculpture, ceramics and furniture by both well-known and emerging artists and craftsmen in the state. She has been instrumental in a number of important acquisitions for the Currier Museum of Art of works by New Hampshire artists. She has served on boards, helped in fund raising, and contributed to the acquisition of important works of art by NH artists for public enrichment. Mrs. Fleisher served on the Advisory Council of the Currier Museum of Art and also served as a trustee of the New Hampshire Symphony Orchestra. She served on the Advisory Committee of the Greater Piscataqua Community Foundation to plan an initiative to increase support for individual working artists in the state. The initiative now makes possible a single fellowship grant, funded at $30,000, which is awarded annually to a visual artist in the Greater Piscataqua region.